Central Montana ranchers, meat processors, and even the mailman all pitch in to bring tasty, healthy lunch to local kids. In this remote region of Montana, the tiny community of Winnett is bucking the trend that tells us that rural communities are dying. Instead, it is thriving. Young people are returning and community engagement is high. Longtime community leaders have joined forces with the upcoming generation and are working for the people, the livestock, and the land for which they are responsible. This group of cattle producers is known as the Winnett ACES (Agricultural and Community Enhancement and Sustainability). In November 2016, ACES met for the first time to discuss the future of their community and how to make it stronger and more resilient. The group created a “wish list” of projects to tackle, and first on the menu was serving healthy, locally grown beef in the community’s school. It took the Winnett ACES only three months to put the idea of serving locally raised beef in it’s K-12 school into practice. By February 2017, the Winnett Public Schools began serving locally raised beef to its students. 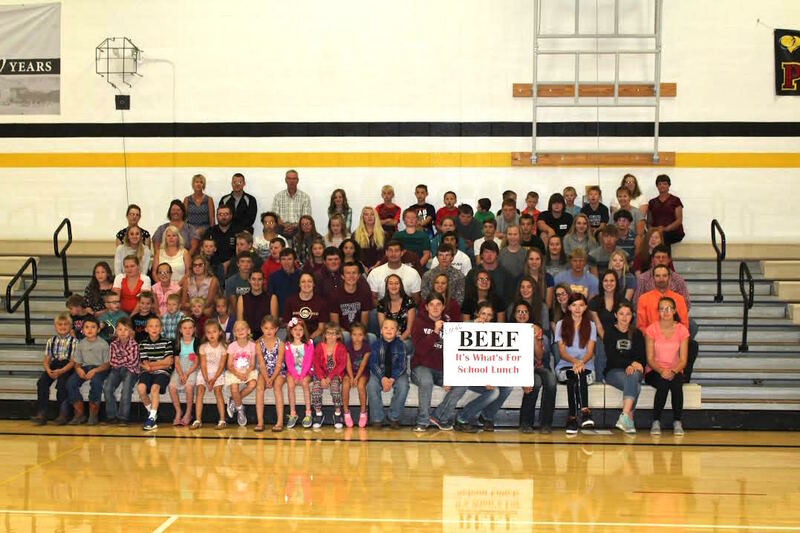 Initiated by Charlie Ahlgren, local producer and father of three, the Winnett Beef in the School program got off the ground with support from the Winnett ACES, the Petroleum County Stockgrowers, and the Winnett Public Schools. To get the idea rolling, the Petroleum County Stockgrowers put out a call to members for interest in donating. Within two weeks, there was enough commitment from area producers for three years’ worth of beef. Other community members offered monetary donations, transportation to slaughter facilities, and grain for finishing the animals. In the meantime, the school cook readily agreed to use local beef in her meals and the school board approved the idea. Once the program got off the ground, more producers chipped in, and there are now four years worth of donations. The program is no small feat — the school feeds approximately 100 students and staff every day and requires approximately four beef per year. The four animals for the year are taken on the same day to Winnett by the donating producers, a brand inspection is done, and a volunteer transports the animals to a USDA-certified slaughter facility in Miles City. The mail truck then takes the meat from Miles City to Jordan where it is processed by Ryan’s Meats; Ryan’s donates freezer space for the processed meat until there is space in the freezers at the Winnett Schools to store the meat. The first beef donations for Winnett Schools get set to roll out of Petroleum County. From left: Jonte Stahl (brand inspector); beef donors Ashley Obrigewitch (Foster Ranch), Reba Ahlgren (Ahlgren Ranch) and Jay King (King Ranch), who also trucked the animals to Miles City. Ahlgren explains the program’s success simply. “Everyone in small communities wants to do good things,” he said. Laura Nowlin is the coordinator for the Musselshell Watershed Coalition and a member of ACES. She lives on the family ranch with her husband and two children north of Winnett on a tributary to the Musselshell River. Feature photo: Winnett Schools, Grades 1-12, and staff. Photo courtesy of Reba Ahlgren.